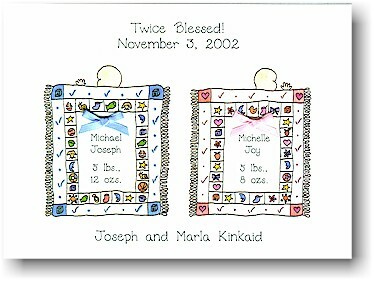 White card with twin baby boy and girl underneath blue and pink accented quilts. Card is shown with 2 OPTIONAL bows (Blue Bow B-02 and Pink Bow B-01). White flat card with baby boy (sailboat, fish, baseball) and baby girl (flower, heart, bow, bootie) things in the corners. Border is pink dots and light blue marks. Use a bow for baby on left? Use a bow for baby on right?